If you are new to the hobby of model trains or if you'd like to improve your layout with these free tips and techniques, read on! I've been playing with trains and building layouts for more than 60 years. My site is for beginners and average guys and gals who like model trains. Seasoned model railroaders will also find some nuggets of information and photos I've picked up on my journey. I've learned a lot, made many mistakes (and still do) and have developed some favorite techniques. Now that I'm retired I can take the time to share what I've learned with you. I've been adding information to this website since 2008 so you'll find lots of useful tips and techniques for just about all aspects of model railroading. I model mainly in HO and some G but have experience with most of the common scales. Much of the information here is applicable to all scales. I hope you find the tips and photos helpful. Model railroading is a wonderful, lifelong hobby that you can enjoy alone or with friends. I have no affiliation with them but I am a keen supporter. Not only is the free monthly magazine packed with great ideas, the forums are an incredible asset. If you like train-photos and train videos there are lots here from railroad clubs, conventions and layout tours. Check them out and be inspired. There are pages here with lots of tips I've picked up during a lifetime of being around prototype trains and model trains. These include starting a model railroad, techniques for hand-laying track at a reasonable cost, wiring your railroad with DCC, remotoring DC engines and installing decoders, making scenery and backdrops, kit building and weathering models, my adventures in adding signalling, a guide to train operations to give your railroad purpose, and my favorite modelling tools to make the work easier and more fun. I model mainly in HO, HON3 (narrow gauge) and G scale. However, there's lots here about all scales including live steam and radio-control videos. 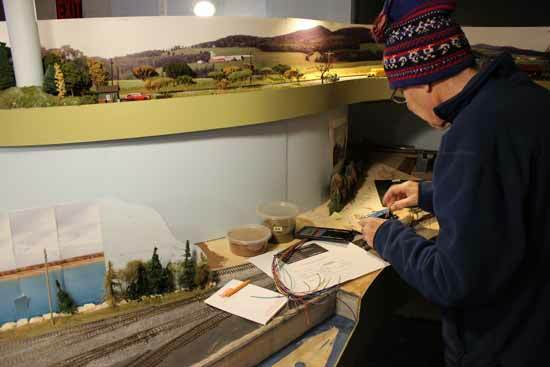 There are also pictures and video clips of prototype full-size railways such as the Canadian Pacific Christmas train and the tourist railroad from Hull to Wakefield, Quebec. There are some pictures of the great storm that destroyed our family-owned railway, the Tobique Valley Railway (TVR) in New Brunswick, now abandoned. I am in the process of building a new Utopia Northern. The previous layout had to be dismantled because we were moving to a new home. The space i now have is about half the size of the old layout. But I also have room for a garden railway now in G scale. When I stopped, the old layout was 90% complete. There was still some scenery to finish, especially around the city of South Point behind the terminal office pictured to the left and a backdrop was needed behind Summit Siding. Most of my model railroading and railfanning have been done in Canada and the Northeastern region of the United States. There are photos from farther afield and information about world railways that I have visited or read about. This information site will keep growing. Visit often if you like what you see. You can also join by RSS and receive updates when I post new material. If you haven't used RSS before it is totally anonymous. You'll find the orange RSS icon next to Recent Articles in the right hand column. Hover your mouse over the orange icon and you can choose RSS or several alternatives. This will provide you with instant knowledge of what's new or revised on this website. The Navigation Bars list the main sections and pages of this website for quick linking. There are more than 250 pages so there's lots here to keep you busy. The top Navigation Bar takes you to main sections. Hover over the header and a sub-menu will appear with links to primary topics. Each page you pull up has other jump-to links at the bottom of the page. I've also included links to popular topics in the right hand column to make it easier to find what you're interested in. I am also interested in adding in your favourite tips to supplement mine. You'll find some comments here already. Feel free to use my photos and I look forward to being able to share your pictures with other modellers around the world. I'd like to add photos from countries beyond North America because I know modellers from around the globe have been visiting my site. In the meantime, I'm happy to answer emails. Use my Contact Form. There's a link in the right hand column. Thanks for dropping by my basement. Let's power up and get rolling!